Fancy a drink around the firepit and infinity pool, Bamurru Plains Lodge (photo: Peter Eve). 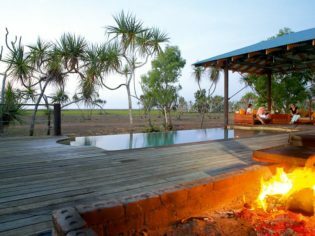 Airboats, chilled towels and champagne – Bamurru Plains Lodge is just one of two luxury accommodation options on the outskirts of Kakadu you may want to seriously consider. The airboat skims the shallows, parting a floating carpet of pink water lilies and providing an exhilarating look around the Mary River Wetlands, just west of Kakadu National Park. If you get the feeling you are being watched, you are right – there are thousands of magpie geese, plumed whistling ducks, egrets, ibis and jabiru on high and the odd crocodile spying from under those lilies. Wild brumbies graze on a green pick in the shade and we spot a bush pig in a hurry. The airboat tour is just one of the activities at Bamurru Plains, an eco-sensitive luxury bush camp on Swim Creek Station, where nature takes centre stage in this wild and wonderful landscape. A new bird hide is ready for this season so guests can spot some of the 236 species that take to the skies. Spot the Croc cruises on the nearby Sampan Creek, where big fellas sunbake on the banks, bird-watching tours and guided walks all provide many surprises. The 4WD tours seek out water buffalo and brumbies, and end with sundowners and a toast to spectacular sunsets. There are also extended tours to Kakadu and Arnhem Land, and great fishing in season – banish any thoughts of the one that got away. Step into the main lodge and there’s a long timber dining table, a lounge area where you can flop, and a library of reference books that reveal everything about the Top End. Guests can help themselves to the open bar with wines, beer and spirits, and watch Indonesian chef Made Mustika work his magic producing outback cuisine with a sophisticated edge. Outdoors there is a deck complete with fire pit, open-air pavilions with comfy couches for lazing on, and an infinity pool that is perfect for watching wildlife at play on the floodplains. Dusty buffalo and their raucous offspring wander by the 10 safari-style bungalows while inquisitive wallabies chill out under shady trees – but they keep their distance. or two, and there’s an ensuite with a powerful shower. You won’t find a television, CD player, mini bar or even mobile phone reception here; instead, sink into a comfortable bed with eco-cotton sheets and a choice of three pillows and focus on nature’s stage show. As for music, the bush provides an early morning wake-up call with a chorus of thousands of magpie geese, and frogs break into a croaky serenade at night. Be warned: the landscape has an uncanny knack of seducing all who stay with many planning return trips. The chilled towels and bubbles don’t go astray either. Getting there: Bamurru is a three-hour drive east from Darwin, to the north-west of Kakadu National Park on the Mary River floodplains (but not in the national park). Staying there: All meals and beverages included, including alcohol. Activities additional. In the wet: Bamurru Plains Lodge closes from 1 November to 1 February. From 2 February until the end of April, Bamurru becomes a dedicated barramundi fishing lodge. Morning tours of the floodplains aboard the lodge’s airboats are an exhilarating and unique way of exploring this lush environment, taking you across carpets of water lilies and into groves of paperbark trees. In the late afternoon, four-wheel-drive tours are run when cooler temperatures bring out more animals. From the open-topped safari vehicle you are likely to see agile wallabies, buffalo, wild brumbies, floodplain monitor lizards, and prolific birdlife including blue kingfishers, whistling kites, sulphur crested cockatoos, cattle egrets and ibis. Mary River catchment is a bird-watchers’ paradise, with about 236 species, many of which are found at Bamurru Plains. Fishing guides can also be arranged. The best fishing seasons are from February to May and in October/November, with fishing either in the rivers or on the floodplain. Barramundi are regularly caught. Cruises on the Sampan River, which forms the western boundary of the station and claims one of the world’s largest crocodile populations, are run from April to October. These activities are included in the tariff. For an extra cost, scenic helicopter flights can be organised on request. They offer a different perspective of the floodplain and northern coastline. Day tours to learn about Aboriginal culture and view the rock painting galleries in Arnhem Land and Kakadu National Park can also be arranged at extra charge. Day trips can be taken by road, small aircraft or helicopter. Of course it costs more, but air is the best option as it reduces travel time and allows for spectacular views. Skimming across the Mary River floodplain on one of the lodge’s airboats is an experience unlike any other – especially at the end of the Wet season when the waterlilies are in bloom. Touring the floodplain in this way allows you to spot prolific birdlife – including Jabiru, tiny Jacanas (called “Jesus-birds”) and the magpie geese that give the lodge its name – as well as crocodiles and lumbering Asian water buffalo.